The Fort Wayne area is rich in sports history and heros. From the NBA Fort Wayne Zollner Pistons to NFL Hall-of-Famer Rod Woodson, Fort Wayne has been a hotbed of talent, events and sports innovation. To capture some of the individuals, teams, milestones and achievements, the Fort Wayne Sports Foundation embarked on a mission of producing a series of short videos, chronicling the stories of each in pictures and words. Over 35 thirty-second to three-minute vignettes have been produced. The videos were developed, produced and designed to be available to the public via kiosk displays located throughout town. Funding for these kiosks was provided by the Waterfield Foundation. Subsequent kiosk development was also supported by Eric Wedge. 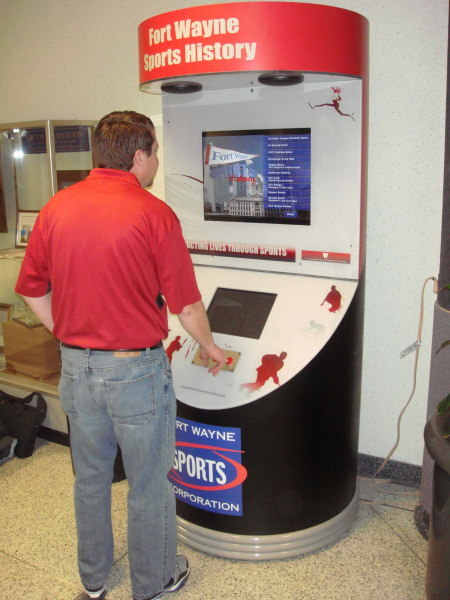 The first of the kiosk displays was unveiled at the Fort Wayne Sports Corporation's Annual Banquet on January 19, 2008. Kiosks are now located at the Grand Wayne Center, Memorial Coliseum and Fort Wayne International Airport. Hilliard Gates Lifetime Achievement Award - first presented to long-time broadcasting icon, Hilliard Gates, this award goes to individuals or organizations that have played a significant role in Fort Wayne area sports for many years. Special Achievement Award - presented to individuals, programs or organizations recognized for an important sports accomplishment. Community Award - Given to individuals, programs or organizations that have had an important impact in the sports community. Judy Stuart Service Award - presented to those individuals or organizations whose volunteerism greatly influenced the Fort Wayne sports landscape. The award is named after Judy Stuart, who's time and effort on behalf of the FWSC helped elevate the organization to new levels of success. Take a look at the list of people, programs, teams and organizations recognized over the years as part of FWSC's honoree Hall of Fame.